Succession planning isn’t just about tomorrow. TMG’s work on thousands of C-suite successions brings the deep expertise needed to set up your company for the short- and long-term ahead. With no search firm affiliation, we are dedicated only to making sure you have the best process for identifying the leaders your organization needs. How well do know your talent? Building a high-performance organization starts with an accurate assessment of its leaders of today and tomorrow. TMG assessments reveal potential for growth and opportunities to develop, and give your executive “bench” a customized action plan for success. Get your talent to perform at their best. 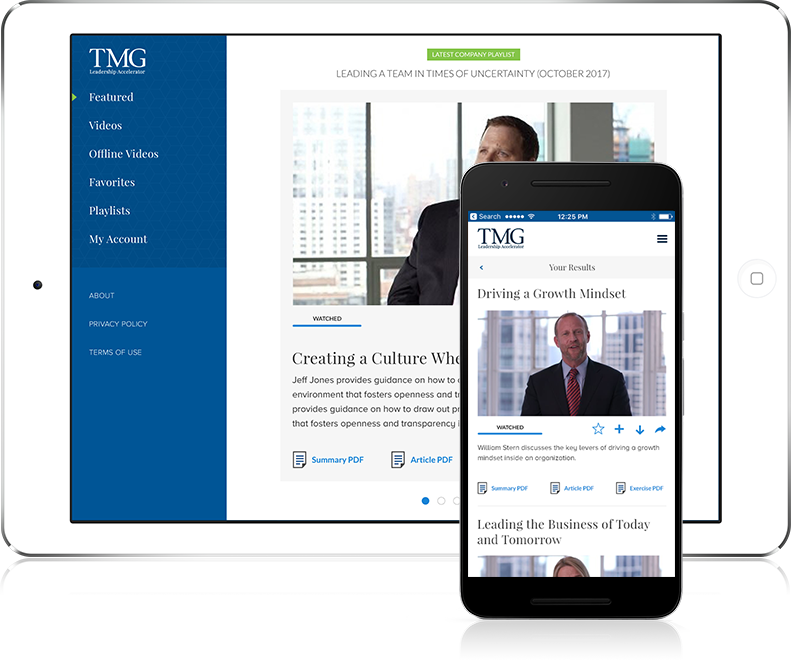 TMG coaching engagements are highly personalized, and tap into our decades of experience working with the highest-performing executives in the world. We focus on the individual in the context of the entire business and the company culture – allowing talent to maximize their impact on the organization, their teams, and key stakeholders. TMG’s board optimization methodology is grounded in years of advisory work with chairmen, lead directors, board members, and board committees to leverage greater performance from both individual directors and from the board as a whole. We strive to help boards create a high-impact environment where the whole is greater than the sum of its parts. - Les Brun, Chairman, Broadridge Financial Solutions, Inc.; Director, Merck, Inc.
A powerful learning and development tool for leaders at each level of the organization. TMG develops talent strategies for organizations, teams, and individuals – focusing on high-performance, world-class leadership. We advise top global corporations through CEO succession, executive transitions, board assessment and training, and talent development. Our coaching and advisory services enable leaders to raise the bar on their own performance, as well as create an environment for success throughout the organization.